Potato, Cheddar, and Chive Torpedoes: BBAC#42 ~ I Can Do That! 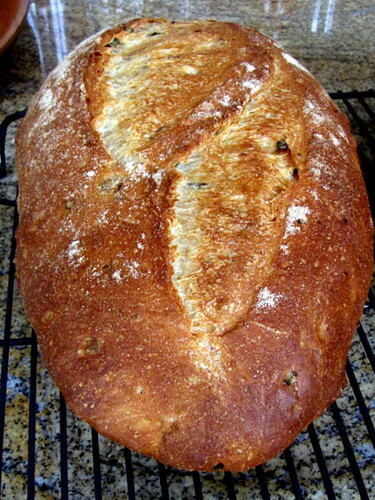 Boy, am I grateful to Peter for sharing this bread recipe from one of his former bakers, Tim Decker, because it is simply superb. 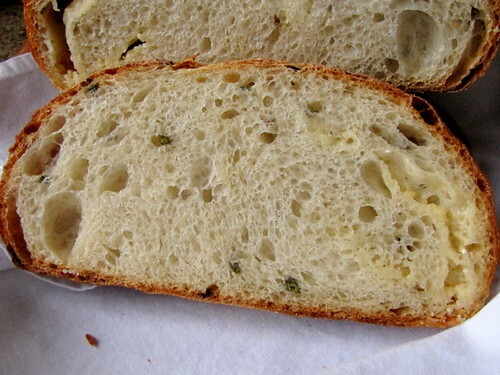 Just like Potato Rosemary Bread, I love everything about it: the soft somewhat elastic slightly open crumb that is moist and flavorful with a subtle garlic flavor from the chives, the most wonderful chewy dark brown crust, and its aroma, oh yeah. The aroma wafting through the house while baking makes you want to tear at the bread right after it comes out of the oven. Anyway, I made two 25-ounce loaves, each grew really big at 12 inches long, 6½ inches wide, and 3-inches tall. That's a lot of bread! The recipe is an easy to make same-day bread leavened with both wild (sourdough) and commercial yeasts. Boiled chopped unpeeled potatoes and chives are added to the dough. Slices of sharp cheddar cheese are laid on the dough halves that are shaped into 6 x 8-inch rectangles. The doughs are rolled jelly roll style then shaped into torpedoes, the cheese creating pockets that look nice when the bread is sliced. I used white extra sharp Vermont cheddar cheese, sooo good. I will increase the amount of cheese next time I make these which is going to be very often. I love this bread! Wow! That looks amazing! I can't wait to make this. Had to do King Cake this weekend. Maybe I'll get to it next weekend. The white cheddar sounds like a good call. Another nice looking bread ! Wow! Those looks so delicious! Can't wait until I finally reach it! What a beautiful loaf of bread! Must taste delicious! 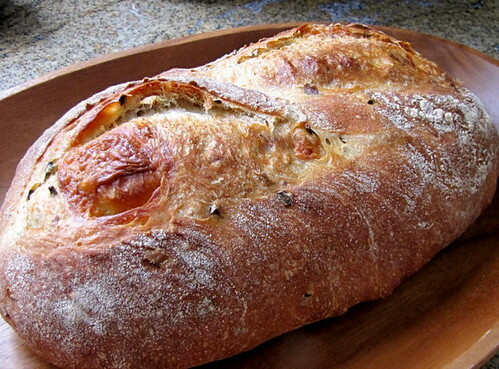 Your first picture may be the most beautiful picture of bread that I have ever seen. Unfortunately, the wheat bread is standing between me and this loaf. 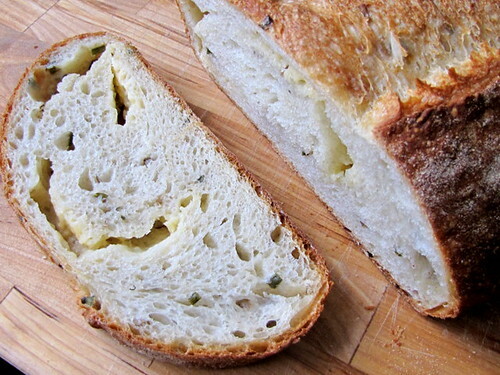 Love sharp white cheddar ~ I will have to use it when I finally get to this bread. Your bread looks absolutely STUNNING...good job! Those tunnels filled with cheese look irresistible.